Wendy Reid Crisp, author of the spirited declaration-of-independence 100 Things I'm Not Going to Do Now That I'm Over 50, turns her gimlet eye to the next watershed age for boomers: turning 60. She celebrates sixty as an age of independence--the independence to love, support, respect, accept, and forgive ourselves and others. 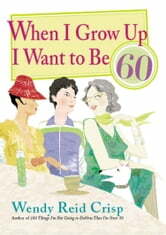 In her wry, inimitable style, Crisp explores the fun, invaluable life-lessons sixty-somethings need to know--because sixty has never been like this! "Well...What Did the Doctor Say?"